Safety Spotters On Each Post Can Be Adjusted Accordingly. 【Sturdy & Durable】This dumbbell stands are made of reinforced steel, the load capacity up to 390lbs. 【Adjustable Height & Spotters】Range of 42"-67" Height. 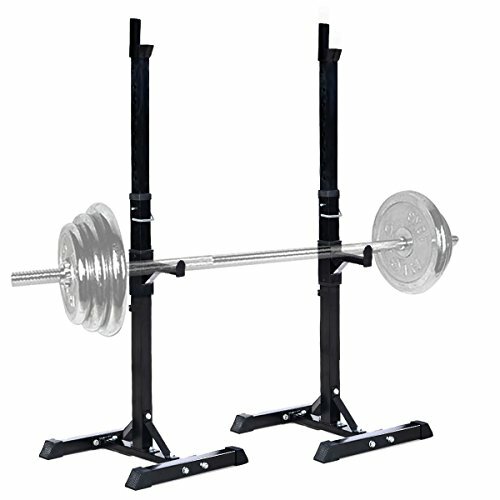 Adjustable barbell rack makes it suitable for a variety of heights, and adjustable spotters for your safety. 【Safety Guaranteed】Rubber end caps that protect yourself and your floor from scratching, and legs are welded on straight, stand upright without wobbling. 【12 Heights Adjustable】There are 12 adjustable heights to fit your workout requirements. You can adjust according to your physical conditions. 【Easy to Assemble】Designed for easy installation. Full instructions & all mounting hardware are included.